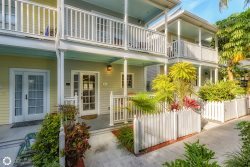 Elegance and modern sophistication are apparent as you enter any one of these six newly complete townhomes conveniently located in a quiet Old Town Key West neighborhood just three blocks from Duval Street. Construction was completed in 2007 on these beautiful villas that boast over 1700 sq ft. on two levels. Each has it’s own private garden with heated pool. The open living/dining area features comfortable sofas and chairs, and a dining table to seat six. Just off the living room is your complete and fully-equipped modern kitchen with top-of-the-line appliances and a center island/bar. The half-bath is situated in the hall between the foyer and kitchen. Sliding doors open from the living area to a deck and the pool edged by variety of tropical plants. An inviting deck surrounding the pool provides atmosphere for peaceful conversation and relaxation after a day of sightseeing. One bedroom is on the first level with a queen bed and en-suite bath with shower only. The second level of the house offers two bedroom suites with en-suite bathrooms. The bedrooms are expertly decorated to offer luxury without being overbearing. Spacious and plush, the master suite has an elegant king bed and a grand tiled bath with his-and-hers sink and large shower. The second bedroom has two twin beds (which can be converted into a king upon request) with luxurious linens and an en-suite bathroom with tub. The villas are equipped with central air-conditioning system, flat-screen TVs, security system, and fully-equipped kitchen. These elegant villas are a destination for those expecting a special and exclusive holiday with the warm atmosphere of your own home! Located across the street from the Basilica of St. Mary Star of the Sea, it is the perfect spot for destination wedding parties. Parking: One off-street reserved spot; on-street parking also available. Sleeping Arrangements: King, queen, 2 twins (converted to king upon request). Pets: Sorry, no pets. No exceptions. Location: Three blocks to world famous Duval Street in the heart of Old Town Key West. Key West Holiday Home was lovely. Plenty of space. Walking distance to all attractions. Owners provided all information needed to enjoy visit. Would gladly go again. 4th Time at Townhomes on Windsor The headline should tell you everything you need to know, but here's why we keep going back to Townhomes on Windsor... The place is huge, beautifully decorated and has every amenity you'll need. The gourmet kitchen and poolside grill can save you lots of money. If you've ever eaten out in Key West, you know what I mean. The excellent staff at Key West Hideaways goes out of their way for you, without getting IN your way. They rock. Location: just four blocks east of Duval for easy access, but without the 24-hour noise. Huge pool and deck area, but with enough natural shade that you're not constantly in the sun. It's very clean. Little things: washer/dryer, Keurig coffee maker, TVs throughout (but don't be surprised if you never turn them on), decent wifi, nice toiletries, huge refrigerator, 2 balconies, ceiling fans everywhere. If you can afford it, or have a large group to split costs, do it. You'll want to come back time and again -- but don't take my favorite dates! The Town Home was Wonderful! My girlfriends and I stayed the "Luxurious Old Town Home" from Oct 9-12, and we couldn't be happier. When we entered the townhouse, it was all "oohs and ahs." When the ladies and I got upstairs, it was more of the same. Everything is gorgeous and immaculately clean. The pictures don't do the place justice; the dcor and furnishings are classic yet "island modern" with high ceilings, soothing paint colors, and a comfy sofa and chairs that invite relaxed conversation. The bedrooms have spacious closets (nice hangers - not the crappy kind that mess up your clothes), lots of dresser room, comfy beds, and two of the bedrooms have balconies. The bathrooms are marble, with nice, thick towels and luxury toiletries. There were 5 of us and we never felt like we were crowded. And the pool area - OMG!! The pool is about 15-20' long and about 5' deep w/a beautiful deck area with lovely landscaping that made us feel like we were in our own little paradise. And there's a nice-sized grill, and lounge chairs and little table and chairs so we could sip our wine between dips in the pool. Randy and the guys at Key West Hideaways take care of everything - there are nice beach towels and everything a kitchen needs; when he said that all we needed was our toothbrushes, he was right! The property has an ample parking area. You're within easy walking distances to restaurants and shopping and downtown, but away from the craziness. My girlfriends and I are already trying to figure out when we can find some time to return for a much longer visit!